It’s finally summer again and it’s time to treat yourself! We have all been there- the kids are playing outside- you hear the ice cream truck coming. I can never manage to grab my wallet in time to get money out. When I do manage to get my money out- one ice cream cone or ice pop is outrageously expensive! Here is a tip- go to your local Walgreens and grab what you are craving. This is ideal for hot summer nights with the entire family, and it’s super convenient so you don’t have to make that grocery store stop or wait around for the ice cream truck. We headed to Walgreens to have an ice cream party with the nephews and my daughter, Lydia! 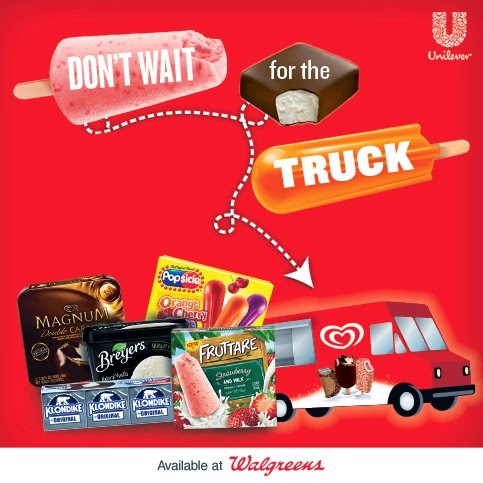 Walgreens carries several Unilever ice cream brands! Brands you will see such as Magnum Ice Cream, Breyers, Klondike, Frutare, and Popsicle. Lydia chose to get Bryers. She said she wanted to have ice cream cones. They did not have many choices in other brands that she wanted- but when she has her mind on one thing- that is usually what she gets. She chose to get Bryers BLASTS! Oreo Bryers Natural Vanilla and Bryers Chocolate! She also picked out two packages of ice cream cones. Everything here cost her a few cents under $25. The kids played in the sprinkler and water. While having a blast, I knew these cold, sweet treats would be awesome for them! I "took their orders" and headed outside right away! As you can tell, they all enjoyed it! What is not to love about cold ice cream on a hot day? Head on over to your local Walgreens and check out all of the Unilever Brands Today! You won't regret it, that is for sure! Be sure to follow Unilever and Walgreens on their social media below! What is your favorite Unilever Brand of Ice Cream? Magnum, Breyers, Klondike, Frutare, and Popsicle? Win It: One reader is going to win a $25 Walgreens GC to head to Walgreens for their frozen goodies (or whatever you want to buy). Winner must live in the Continental USA. Giveaway ends 8/8 at 11:59PM CST. Entrants must complete the mandatory entries to qualify. Completing all entries will increase your odds. No purchase necessary to enter. ONE PERSON per household may enter. Must be 18 or older. Enter with the giveaway tools below. Goodluck! Kondike & Breyers are our family favorites. Magnum Ice Cream Bars are my favorite!! I think getting Ice Cream at Walgreens is such a good deal. They have a lot to choose from, and the prices are good. I love them all...but my favorites would be Breyers and Klondike. I am still a sucker for a Fudgesicle, but there aren't many things I wouldn't do for a Klondike bar. My favorite are Magnum Bars. I love Breyers Ice Cream! My favorite from the uniliever brand is Klondike! I can see the kids now they would love this. Including all of our neighborhood kids. I agree with Lydia ~ Breyers is the best! I'll have to go with Popsicle, because it's been my love forever. It's hard to choose. I think Klondike is our favorite. The Magnum Bars are my favorite, so decedant! The Magnum Bars, so rich and decadant! I love the Breyers Ice Cream! My favorite Unilever Brand of Ice Cream is Magnum. Our favorites and the one we buy most often is breyers or Magnum. it depends on what is one sale at the store. Hot Summer is the perfect time to have all the ice cream treats you want, stores know it too, they put on great sales. I love Breyer's Ice Cream. I love the Klondike Bars. Those Magnum bars are sooo good, but I can rarely justify them. Breyers is my favorite. All-natural and all delicious!